SPG has launched a new offer to promote the Keyless initiative where members can bypass the front desk and enter their room at select properties by using smartphone. 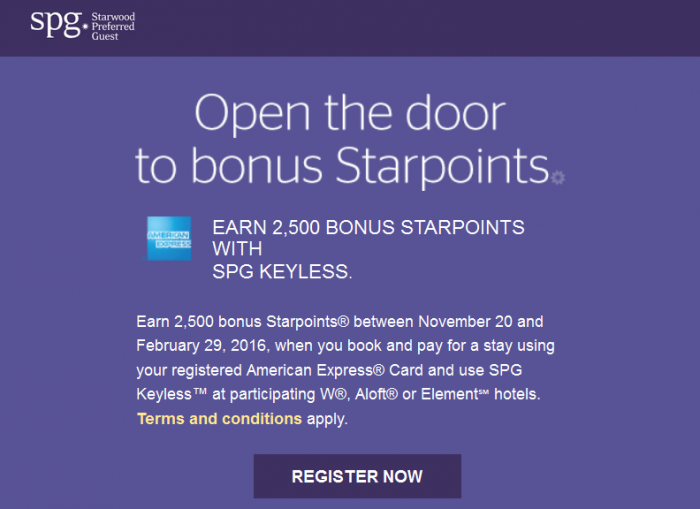 You can get 2,500 bonus Starpoints if you book and pay using American Express card, and have opted in for the Keyless (and probably use it at least once). Note that you can earn the bonus points maximum of one time. Not sure how well the members have adopted the idea of using their smartphones to enter their rooms/suites and bypassing the front desk altogether? There is a reason to use the service at least once and collect the 2,500 bonus Starpoints that are on offer, however. Members must register for this offer online with a valid SPG account number at spg.com/amexkeyless by February 29, 2016, midnight Eastern Time (ET). Card Members who have registered for this offer, downloaded one of the SPG mobile apps, registered their mobile device, and opted in to SPG Keyless are eligible to receive a one-time 2,500 Starpoints bonus for one (1) consumed stay between November 20 and February 29, 2016 (the “promotion period”). Card Members must book and pay using their registered American Express® Card. Bookings made prior to the promotion period are eligible for this offer, but only eligible stays consumed during the promotion period will receive the bonus. Registered members may earn a maximum of 2,500 bonus Starpoints during the promotion period with a one room max. This bonus is eligible at participating SPG Keyless properties. You must first register for this offer, download one of the SPG mobile apps, register and opt in for SPG Keyless and then book and pay for a stay using your registered American Express® Credit or Charge Card. For more information on SPG mobile apps and keyless, please visit www.spg.com/keyless. Must be a member of Starwood Preferred Guest to register for offer and receive Starpoints. Enroll for free at spg.com. Bonus Starpoints will post to the registered member’s account within 2–4 weeks after the qualifying stay posts. An Eligible Stay is defined as one or more consecutive nights paying an Eligible Rate at a participating SPG Keyless W®, Aloft®, or Element(SM) property regardless of the number of check-ins or checkouts that occurs and post to the member’s Starwood Preferred Guest® account. Eligible Stays with at least one night in the promotion period will receive a bonus. An Eligible Rate is any rate that is eligible to earn Starpoints in the Starwood Preferred Guest program. A description of SPG-participating hotels and resorts and of Eligible Stays and Eligible Rates can be found at spg.com under Terms & Conditions of the SPG program. See Section 1.4 b iii for the complete definition of Eligible Rates. All promotions are subject to the Starwood Preferred Guest program terms and conditions, which are subject to change without notice and can be found at spg.com. Offer is applicable to individual members only and not to groups. Not responsible for clerical or typographical errors. Starwood reserves the right to discontinue this offer at any time. Fulfillment of the offer is the sole responsibility of Starwood. To update your communication preferences or learn about our privacy practices, view our Privacy Statement on spg.com/privacy, or access our privacy information line by calling 1-877-782-0071 in the U.S. and Canada or +353-21-4930474 in all other countries. Starpoints, SPG, Preferred Guest, Sheraton, Four Points, W, Aloft, The Luxury Collection, Le Méridien, Element, Sheraton, St. Regis, Tribute Portfolio and their respective logos are the trademarks of Starwood Hotels & Resorts Worldwide, Inc., or its affiliates. Void where prohibited by law.